Lion Brand is the proud sponsor of Professional Development Day which will be held in Indianapolis, IN on July 17 and in Charlotte, NC October 2. You can find all the details here http://www.knitandcrochetshow.com/ and we hope you can join us for at least one show! Copyright: All photos are copyright Lion Brand Yarn and are used with permission. Contest will be managed by the Rafflecopter app on the CGOA Professional Development Facebook page. Winner will be selected by random drawing by Rafflecopter. Contest ends July 1, 2013, at midnight EDT. Winner must provide a valid email address to the CGOA Professional Development Facebook page via a Direct Message to the page by midnight EDT on July 8, 2013. If a message is not received by that time, the prize package will be forfeit and another winner will be selected. This promotion is in no way sponsored, endorsed or administered by, or associated with, Facebook. We hereby release Facebook of any liability. Winner(s) will be contacted by email 48 hours after receiving email address. An important milestone, the twentieth anniversary of CGOA, is fast approaching and a grand celebration will take place in 2014. Where did the time go? There is no time like the present to begin planning a fabulous celebration to honor all our members past and present who have contributed so much to our beloved organization. The celebration committee wants to tap into the talents of the creative members of our organization, so they are having a contest to find the best logo for the anniversary celebration. The theme is A Proud Past, A Brilliant Future and the celebration colors are emerald green, white and platinum. Pins and other memorabilia will be made using the winning logo design and it will also be used for all sorts of promotional materials to spread the word near and far that CGOA is alive and well after 20 years! Please send some of your creative energy our way; we would love to have members who are passionate about crochet lend their talents to the creation of this very special logo. 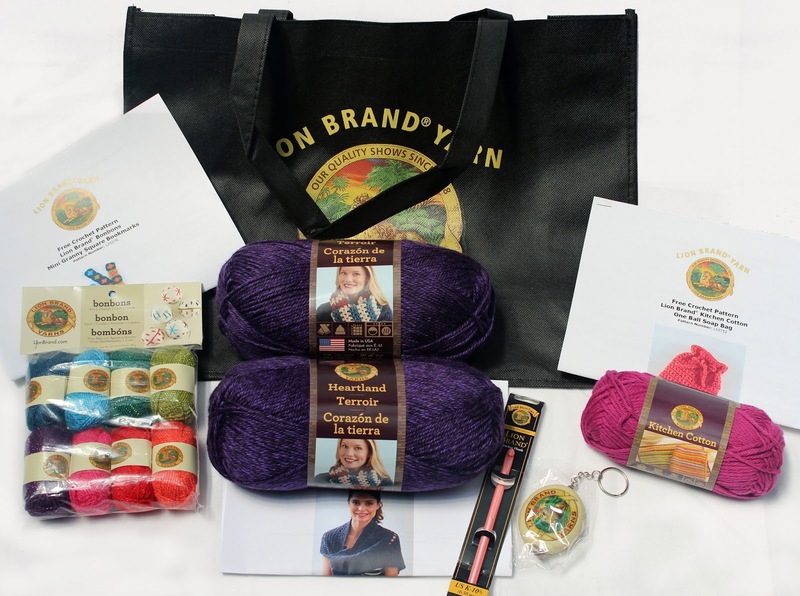 The winner will be announced at the 2013 Chain Link Crochet conference in Indianapolis. and will receive a pin with her winning design plus a monetary prize of $250.00 from Crochetville. Deadline: June 25, 2013. -Submit via email to: CGOA@offinger.com with 20thLogoContest in the subject line. -Winner will receive a logo pin with the winning design and $250.00 from Crochetville! -Submit your logo design in color on an 8 ½ X 10” paper. It may be hand drawn and does not have to be camera-ready format. 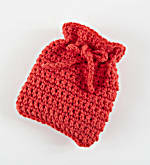 Incorporate the anniversary colors however you choose; Incorporate crochet or a hook, if possible; Have fun, be creative! Are you stumped by social media? Does it all seem very overwhelming? Amy Shelton is going to help take the mystery out of it! You don't want to miss her Professional Development Day presentation of "Making the Most of Social Media"! Facebook. Twitter. Pinterest. Instagram. LinkedIn. Ravelry. Crochetville. There are so many social media sites, and a designer has so little time. Amy Shelton helps our professionals learn the benefits of each site and shows how to create an action plan for spending online time wisely and effectively. Sign up today! Visit Knit & Crochet Show for more information. Many crocheters look upon knit cables with envy and now there’s a book that can help you to make stunning crocheted cable projects. Tunisian Cables to Crochet by Kim Guzman explores the world of Tunisian crochet cables, which look more similar to knit cables than cables crocheted with post stitches. The book starts off with a friendly introduction from Kim, and moves quickly into the Basic Stitches section. If you are new to Tunisian crochet or need a refresher, this section includes written directions along with process photos of the basic Tunisian crochet stitches used in this book. In Step-by-Step Tunisian Cables, Kim introduces her method for creating Tunisian cables, which is a different technique from what I’ve seen described in other books and, from what Kim tells me, this method is different than what she's used in the past as well--an all-new method of doing Tunisian cables. This section includes detailed instructions along with multiple process photos for both right- and left-leaning cables. Kim then shares 11 intermediate level patterns featuring several types of Tunisian cables. The projects are made with heavier yarns (medium and bulky weight) so that the dimensionality of the cables is really emphasized. Kim’s projects are in a range of sizes so you can practice your cable techniques on something small, like the Geneva Headband, or something large, like the Verona Ruana. Several of the larger projects are created using a join-as-you-go method, so several smaller components form the final project and some projects allow you to use a regular crochet hook instead of the longer Tunisian (afghan) hook. The book finishes with appendices that include metric conversion and an illustrated stitch guide. 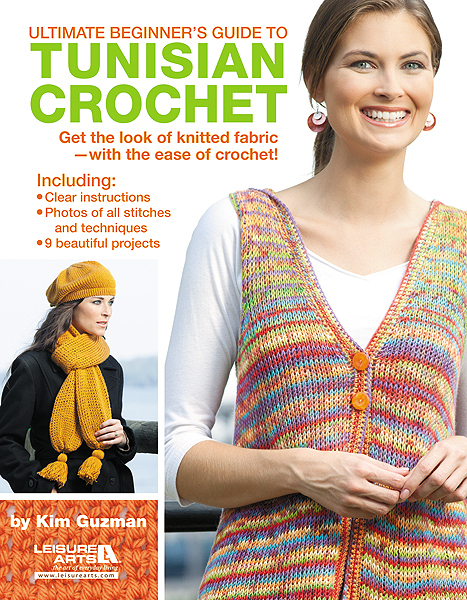 All of the patterns in this book are rated intermediate, but Kim includes detailed instructions of Tunisian crochet basics and her method for cables. As a result, a (patient) advanced beginner could also dive into these projects. The patterns are written with abbreviations and there are no stitch symbols used in this book. For Tunisian crochet newbies, Kim references the relevant instruction pages when stitches or cables are first introduced in each pattern. Although there are 11 great projects in this book, it is really more of a “technique” book than a project book. (Ravelry members can see all of the projects from the book here.) Even if the particular projects are not in your style, this is the most comprehensive book on Tunisian crochet cables available. Once the reader is comfortable with Kim’s method, he or she can easily adapt other Tunisian crochet cable patterns. I would recommend this book to crocheters interested in expanding their Tunisian crochet repertoire, and to crocheters who don’t knit but like the look of knit cables. Although Tunisian crochet cables can be tricky, this book provides a lot of detailed instruction that can help out a Tunisian crochet newbie. 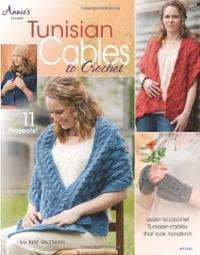 Full disclosure: A free review copy of Tunisian Cables to Crochet was provided by Annie's Publishing. Although I accept free products for review, I do not accept additional compensation, nor do I guarantee a positive review. My reviews are based entirely on my honest opinions. 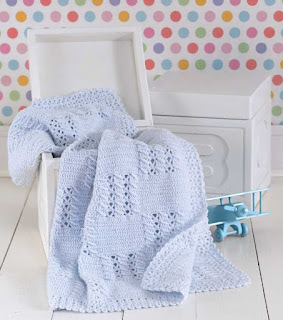 When I saw the stunning blanket design on the cover of Barbara Shaffer's book, Reversible Baby Afghans, I immediately fell in love and knew I had to review this book. The impressive ripple design with the bold color accent, the fantastic textured stitches, and splendid photography shown on the cover intrigued me to see what more Ms. Shaffer had to offer. I wasn't disappointed. Her book features 5 beautiful designs perfect for baby, or anyone else for that matter! I love how she incorporates post stitches to create surprising details, and how those details translate to the opposite side of the blanket. Sometimes it was hard for me to tell which side I liked better. 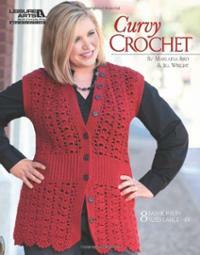 All of the patterns in the book are of intermediate skill level and use light weight yarns. The directions are clearly written and I enjoyed the beautiful photography. In the back of the book you will find the general instructions along with some definitions. Last night, my husband conveniently reminded me that a co-worker is soon to have a baby. 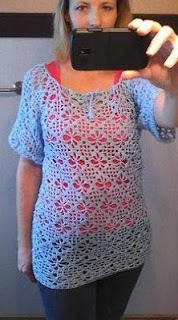 So what did this crocheter do? Of course I grabbed some baby pink yarn and a hook and got right to work on the Building Blocks design featured in Barbara's book. I really am happy with how it is turning out. The pattern is not difficult, but looks stunning. It is easy to read and follow. I can't wait to see how the finished project turns out. If you are looking for a unique blanket to make that will surely become a family heirloom, be sure to check out the designs in Reversible Baby Afghans by Barbara Shaffer. It will probably be my go-to baby blanket book for a while because I have absolutely fallen in love with the designs and can't wait to make each and every one of them! Full disclosure: A free review copy of Reversible Baby Afghans was provided by Leisure Arts. Although I accept free products for review, I do not accept additional compensation, nor do I guarantee a positive review. My reviews are based entirely on my honest opinions. In Short Row Tunisian Fashion, the Queen of Tunisian crochet brings us yet another fabulous offering showing us how to create fabulous garments and accessories while exploring the technique of shaping with short rows. What is a short row, you ask? It is the technique of only working a partial row or rows to create shaping within the structure of a piece. It really is much easier to do than it is to describe. In her latest offering, Guzman creates several stunning garments, including the hooded riding cape, which is really two separate pieces that can be worn together or separately for three totally separate, but equally fabulous looks. 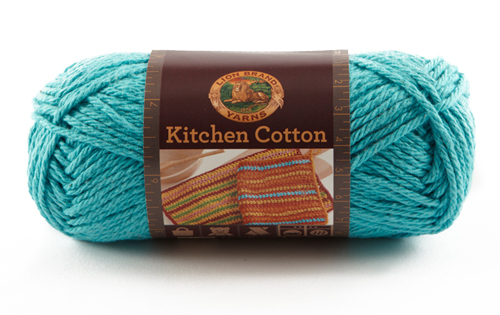 I am also very taken by the Sapphire Wrap, which looks like a knitted shawl, right down to the lacy border. There are a total of six projects, made with anything from light weight yarn (3) to bulky (5). There are photographic illustrations on the basics of making a short row in the front of the book, and just as helpful photos in the back of the book, illustrating the basic techniques, as well as how to do increases and decreases in Tunisian crochet. But wait, that’s not all! There are links to follow on your computer for many of the patterns and techniques for video tutorials to help you master Tunisian short rows. This newest offering from Guzman does not disappoint; it offers good solid instruction on specific projects. 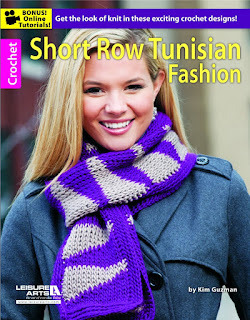 Get this and let it whet your appetite for Tunisian short rows. Who knows? With the instruction that you get from this book, you might even find this book to be a jumping off point for creating your own short row designs! Full disclosure: A free review copy of Short Row Tunisian Fashion was provided by Leisure Arts. Although I accept free products for review, I do not accept additional compensation, nor do I guarantee a positive review. My reviews are based entirely on my honest opinions. Crocheting with Lucy Loop is a storybook on a mission to teach crochet to children aged six to ten years. The book’s author is Karen D. Thompson, a CGOA Master of Basic Stitches, a crochet teacher, and the owner of Hooksations, a traveling boutique specializing in crochet creations. Eventually, Lucy’s patience is rewarded when she is picked up and works together with The Great Hook to be crocheted into a scarf. After the story ends, Karen shares some tips for getting started crocheting with a child, along with a simple scarf pattern. It’s obvious from her tips that Karen has successfully taught children to crochet before. Karen’s enthusiasm is clear on every page of the book, and I think that will transfer to the adult and child reading along. Although the book is self-published, the printing standards are high and it looks just like any other picture book you might see on a child’s shelf. The font is large and easy to read, and the pictures are colorful and fun.There are a few minor grammatical errors which will, of course, only be noticed by the adult reading the book. The real highlights for me of Crocheting with Lucy Loop are the illustrations by Tony Smith, which use vibrant colors and bold facial expressions to bring the characters to life, and the tips that Karen shares for teaching children to crochet. This book would be a great gift for a young child you want to teach to crochet, or for a parent or grandparent who is struggling with teaching their child to crochet. Project type and skill level: 1 beginner scarf. 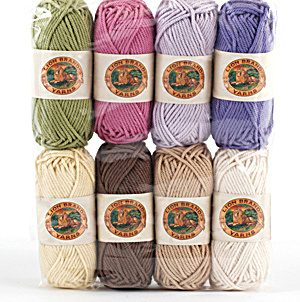 Full disclosure: A free review copy of Crocheting with Lucy Loop was provided by Hooksations. Although I accept free products for review, I do not accept additional compensation, nor do I guarantee a positive review. My reviews are based entirely on my honest opinions. These words are becoming more and more popular these days. And the crochet industry is taking notice! Crochet designers Marlaina Bird and Jill Wright are ahead of the game with their fabulous book, Curvy Crochet. Featuring eight beautiful designs, this book showcases sizes large to 4X. You will find attractive fashions along with accessories for larger sizes. All of the designs in the book are of the easy skill level and use super fine to medium weight yarns. The patterns are clearly written and the designs feature some gorgeous crochet stitch patterns. The designs include a long sleeved sweater, two vests, two short-sleeved tunics, a bolero, a stole, and a felted bag. You will easily find something that you will love out of these amazing choices. With Spring around the corner, I had to break out my hooks and make the Peasant Top for myself! The style is extremely versatile and the stitch pattern is pretty and easy once you get the hang of it. I think my mom would love an A-Line Vest from the book and, when I find the time, I'd really like to make a Cowl Neck Tunic for my sister. Curvy Crochet by Marlaina Bird and Jill Wright is a superior book for all fashion conscious, plus-sized, women and the crocheters that love them. Each design is well worth the time and effort taken to create them. Every classic piece will only enhance your wardrobe and turn heads. You'll happily flaunt those curves while looking and feeling beautiful! Full disclosure: A free review copy of Curvy Crochet was provided by Leisure Arts. Although I accept free products for review, I do not accept additional compensation, nor do I guarantee a positive review. My reviews are based entirely on my honest opinions. In Crochet Scarves: Fabulous Fashions-Various Techniques, Sharon Hernes Silverman has created a collection of 21 scarves that vary from basic crochet stitches to more advanced techniques, such as Broomstick Lace and Tunisian. 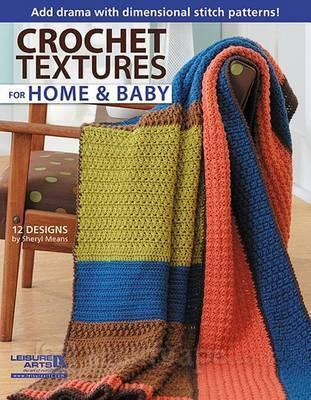 The wonderful thing about this new offering by Hernes Silverman is that with such a great variety of projects, this book is suitable for crocheters at every level as well as beginning stitchers who want to learn more than just the basic stitches. There are four patterns rated “easy”, eleven “intermediate” patterns, and six at the “experienced” level. 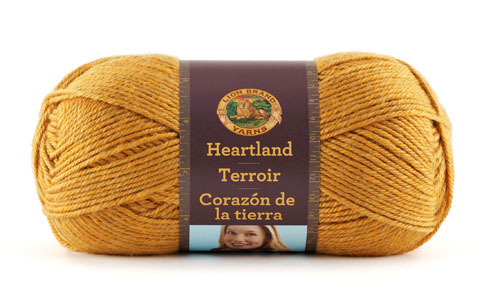 The yarns used in the projects vary from laceweight to worsted weight, and every weight in between. There is even one pattern with the ruffle type yarn that is so popular right now, that anyone can follow to create a trendy ruffled scarf. The patterns are presented with both written and charted instructions, with a page in the back of the book on how to read charts. There are basic technique tutorials in the back of the book. One of the features of this book that I really like are the fact that the illustrations for techniques are photographic, which I think makes the instructions much easier to follow. Personally, I don’t tend to make a lot of scarves, but the scarves in this book definitely make me want to grab a hook and create some of these beautiful creations! In fact, I am pretty sure that there is a skein of mohair in my stash that is just made for the “Champagne Goblets” scarf. 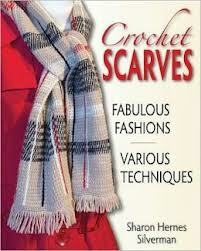 Maybe with this book, I can even get a head start on my holiday crocheting! Full disclosure: A free review copy of Crochet Scarves: Fabulous Fashions-Various Techniques was provided by Stackpole Books. Although I accept free products for review, I do not accept additional compensation, nor do I guarantee a positive review. My reviews are based entirely on my honest opinions. 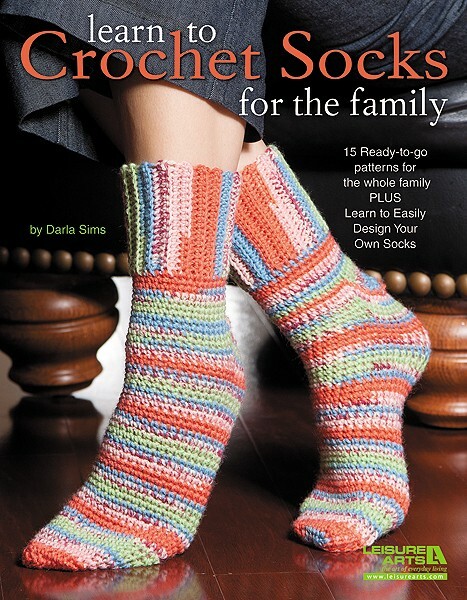 Learn to Crochet Socks for the Family by Darla Sims is a pattern booklet that includes valuable information about sock design and construction. The book opens with a friendly introduction from Darla, who explains that the book gives “the crocheter… lots of choices.” The first six pages of the book are a sock primer. Darla walks the reader through creating a gauge swatch for socks, yarn substitution, and the anatomy of a sock. She explains how to choose stitch patterns to design your own toe-up socks, and gives tips for customizing an existing sock pattern. She includes sizing charts for children’s, women’s, and men’s socks. Budding designers will appreciate the “recipes” she includes. She provides four pages that explain how to design top-down socks (in rounds or in rows; with a flap, add-on, or turned heel; and a tapered, rounded, or gathered toe) or toe-up socks (with an add-on or turned heel). After this introductory section, Darla dives into 15 intermediate level patterns. A full-page photograph of each sock, along with the first page of instructions, are included. (The rest of the patterns are continued towards the end of the booklet.) Patterns are written with U.S. abbreviations and terminology. 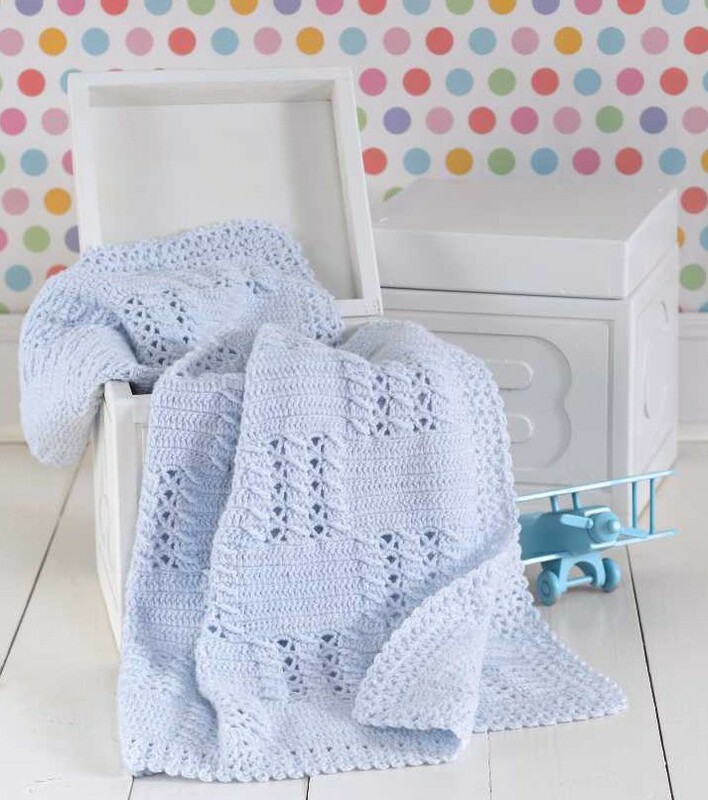 The booklet ends with a general instructions appendix which includes information on yarn weight, crochet hooks, and pattern abbreviations and pattern reading tips, along with written and illustrated instructions for special techniques and stitches used in the booklet. Overall, the patterns in this book are visually appealing and explore a range of construction techniques. Most are shown clearly in primarily solid yarns, but two socks (including the one on the front cover) use variegated yarns that make construction and stitch patterns less obvious. The booklet doesn't include international stitch symbols and includes mostly women’s sock patterns. I would recommend this book to crocheters interested in learning to crochet socks, or sock crocheters who want to branch out into designing or customizing existing sock patterns. The design primer and recipe patterns are very clear, and allow this booklet to stand out from the other sock pattern booklets on the market today. Full disclosure: A free review copy of Learn to Crochet Socks for the Family was provided by Leisure Arts. Although I accept free products for review, I do not accept additional compensation, nor do I guarantee a positive review. My reviews are based entirely on my honest opinions.